One of the first thing that kept me hooked while reading it was that it was an easy read. Sure we are introduced to some new in-book terminologies, but once you get the hang of it you will not be able to put the thing down. Characters: Darrow is a character you can easily symphatize with and you will grow to love him immediately. What I like about him is that he adapts but still stay true to what his ideals are and who he is as a person. With all the fake-ry the story did to him, at the end of the book he is still him and I appreciate that. Also his character development is just spot on for me. The supporting characters too are not just some throwaway people created just for the sake of supporting characters. I don't know how to explain it properly but for me they are just as strong as the main character Darrow. They can hold themselves within the universe. There's this one character which I really really like, probably more than Darrow. The world building was also awesome because the details are scattered properly through the books. And I still feel there's still a lot of potential over the next few books that can still surprise us. Damn I can't wait for the Golden Son already next year. Pacing was 90 percent to my liking. I feel like it hit a sweet spot between the very good climatic events and some soft mellow stuff. I am really excited about the future of this book series. 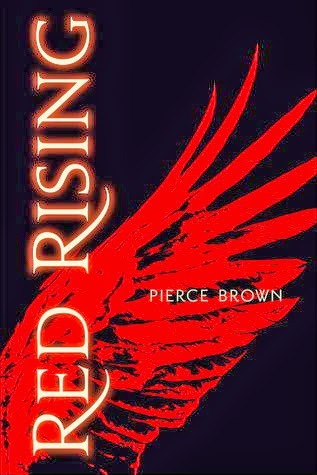 I hope that Pierce Brown becomes more successful. I feel like he is also a cool guy. He replies and interacts with his fans on twitter. He even replied to one of my tweets. Easily one of the big books this year and it really deserves the buzz. One of the best books for me this year. Hi JP! This wasn't really in my radar but now that I finished reading your review, I'm excited to read it. Thanks for the great review. I've found a few books just because of the promotion of a bookshop. This book sounds good, although I don't like it when romance is forced. I'm not a big fan of too much romance in books, so I prefer it to be more natural. I've seen some good promotion for this book, and I wouldn't be surprised if it became the next big phenomenon. Your review solidified that thought - it sounds well-paced enough to have readers hooked. I also appreciate how you complimented the world-building because that is one of the most important aspects in a book like this. I'm glad you loved Red Rising so much, and I hope the rest of the series doesn't disappoint you! I really can't wait to get a hold on that book! Thanks for the review JP! It's great this worked for you so well, especially after knowing little about it initially (sometimes the books that suddenly strike you can be the most amazing reads!). I really hope the rest of the series keeps up this standard/rises above it- it's never nice when the first book is better than all the others.